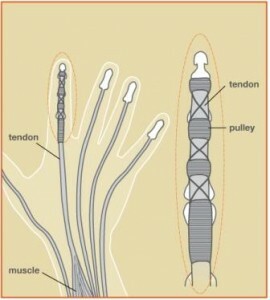 The flexor tendons of the hand are crucial for normal hand function. These tendons bend, or flex, our fingers to make a fist. Each finger contains 2 finger flexors (FDS and FDP tendons) which originate in the forearm, travel through the carpal tunnel in the wrist, and insert on the palm-side of the fingers. The thumb contains a single flexor tendon (FPL). A flexor tendon laceration usually is caused by a sharp object such as a piece of glass or knife. A digital nerve or artery can also be injured at the same time. Flexor tendon lacerations in the hand have challenged even the most skilled surgeons for decades. Repair techniques have improved over the years through research and the patient outcomes have improved. However, some patients can still have problems with stiffness, scar tissue, and decreased hand function. Flexor tendon lacerations are usually obvious to the patient when he or she cannot bend the finger. The diagnosis is confirmed by a physician with a physical exam. Additional injuries to the skin, bones, joints, nerves and blood vessels are also important to evaluate as well. While tendons cannot be seen on x-ray, an x-ray can be obtained to look for a fracture or piece of glass. Early diagnosis and treatment of these injury is very important. What is the treatment for a cut flexor tendon? The wound should be cleansed thoroughly as soon as possible to reduce the chance of an infection. This can be done in the emergency room or urgent care. Patients may be given antibiotics if the wound is dirty or as a preventive measure. Stitches are typically used to close the skin. Clean bandages are applied and the patient is often referred to a surgeon for continued treatment. When a flexor tendon is completely lacerated, the muscle belly in the forearm pulls the two ends apart. In normal conditions, the tendons in the arm are under tension, like a stretched rubber band. If the tendon is cut, the ends pull apart. This gap prevents the tendon ends from joining back together and healing on their own. Surgery is the only way to reconnect the flexor tendon ends. The surgery is often performed on an outpatient basis typically with regional anesthesia (nerve block). During surgery, the tendon ends are brought back together and repaired using multiple sutures. This is called a “primary repair.” The skin incision is extended along the finger and/or palm in order to retrieve the retracted tendon ends. Injured nerves and/or arteries are also addressed at the time of surgery and repaired if needed. If there has been a delay of more than a couple of weeks, it may not be possible to bring the ends of the retracted tendons back together, as the tendon can be shortened or stuck in scar tissue. In this case a tendon graft can be used to substitute. A commonly used tendon graft donor is the palmaris longus (PL) tendon since there is no loss of function after its removal from the forearm. In some cases there is too much scar tissue or inflammation within the flexor tendon sheath noted during surgery. If a graft is placed in this environment, the scar tissue will stick to the tendon (adhesions) and prevent finger range of motion. A temporary silicone spacer (Hunter rod) can be used to prepare the sheath for a tendon graft, to decrease scar tissue formation. A second surgery is required to place the tendon graft and remove the silicone spacer. This is called “flexor tendon reconstruction.” The results from reconstruction are not as good as those with primary repair. Hand therapy guided by a therapist trained in hand care is helpful in the recovery from a repaired flexor tendon laceration. The therapist will guide the patient through the rehab program and help increase range of motion and reduce swelling, scar tissue, and pain. While the tendons are healing it is possible to break the repair. On the other hand, if a patient does not work on range of motion during recovery, the hand and fingers will be stiff. Therefore, patients need guidance by therapists to perform proper rehabilitation. What can I expect after tendon repair surgery? After the surgery, your wrist and fingers will be immobilized in a special plaster splint to protect the repair. The splint will be removed in our clinic after a few days and a removable splint will be made for you. It is important to protect the repair as it heals and avoid attempting to make a tight fist or extending the fingers and wrist. This can put too much stress on the repair. At first, the hand therapist will focus on reducing pain, swelling, and increasing range of motion. Later, as the tendon repair heals, strengthening will be emphasized. I will monitor your progress during rehabilitation and modify the plan as needed. Most patients take at least 3 months to heal, but maximum improvement can take several more months. Recovery time varies among patients, depending on the severity of the injury, possible complications, and pain tolerance of the patient. Sometimes people do not regain full range of motion or strength after the injury. My goal is to help each patient obtain the most function possible. What are the complications from tendon surgery? Possible complications from tendon repair surgery include pain, bleeding, infection, swelling, stiffness, rupture of the repair, and damage to the surrounding nerves and blood vessels. If scar tissue and stiffness become a problem, an additional surgery called a “tenolysis” can be helpful to gain more motion. This procedure is designed to remove scar tissue around the flexor tendons.